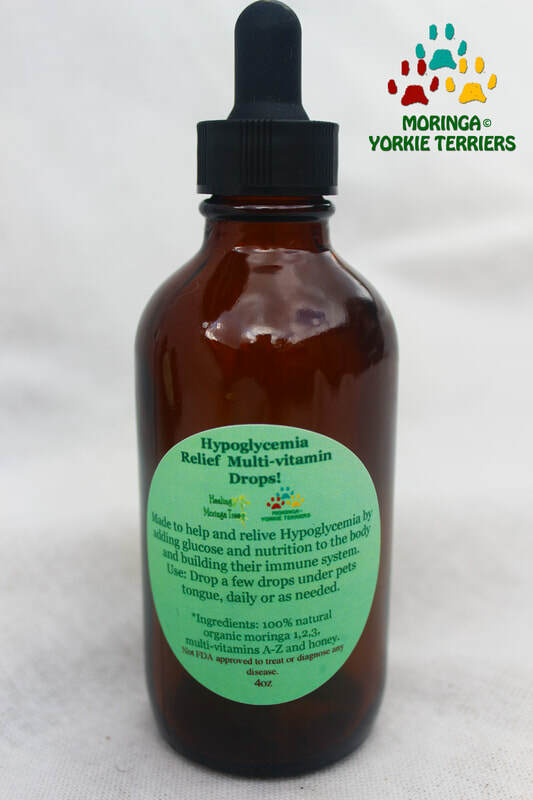 Yorkshire Terrier Hypoglycemia Relief Multi-vitamin Drops! 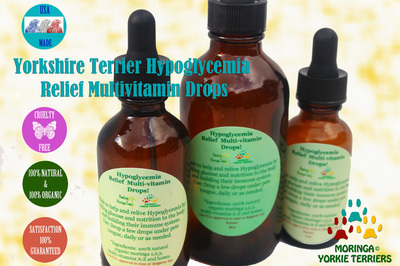 Dog Vitamins & Supplements, Nutri-cal for puppies, Our Multivitamin Drops are made to help and relive Hypoglycemia by adding glucose and nutrition to the body and building their immune system. Hypoglycemia Relief Multi-vitamin Drops for Dogs! Made with organically grown fresh moringa leaves. *I received the drops. Thank you so much. Napoleon loves the taste of his new vitamins. Yorkshire Terrier Hypoglycemia Relief Multi-vitamin Drops your dog will love. Our multivitamin mineral drops are made to help and relive Hypoglycemia by adding glucose and nutrition to the body and building their immune system. *Hypoglycemia is the medical term for low blood sugar, which is a condition in which there is a drastic, sudden drop in the level of blood sugar in the puppy. In small breed puppies Yorkies are one of the most common. *Causes and Signs: Episodes of hypoglycemia often occur without warning. 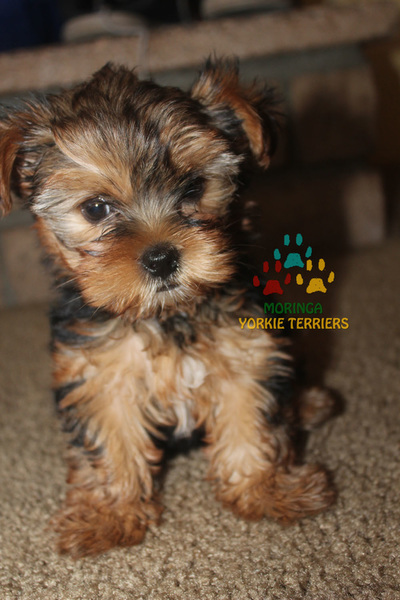 A puppy may be stressed by shipping, or because of their tiny size toy puppies cannot eat a lot at one time, and literally run out of fuel quickly, being chilled, or even exhaustion from too much play may cause the body to use up more sugar than is available. 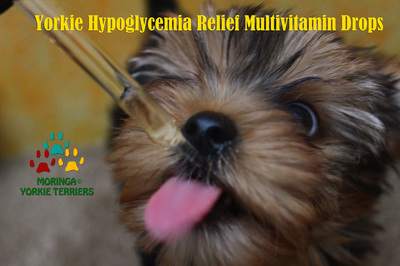 For the young pup prone to this condition, even a brief period of fasting in a toy breed puppy can trigger a hypoglycemic "attack". of an attack are a weakness, confusion, wobbly gait, frothing or drooling from the mouth - sometimes even a seizure and drain of blood from the head. A check of the gums will show them to be pale, almost a grayish white in color rather than a healthy bright pink. The puppy can go into shock and, if not cared for properly and promptly, may even die. *Hypoglycemia can be prevented when you are prepared. 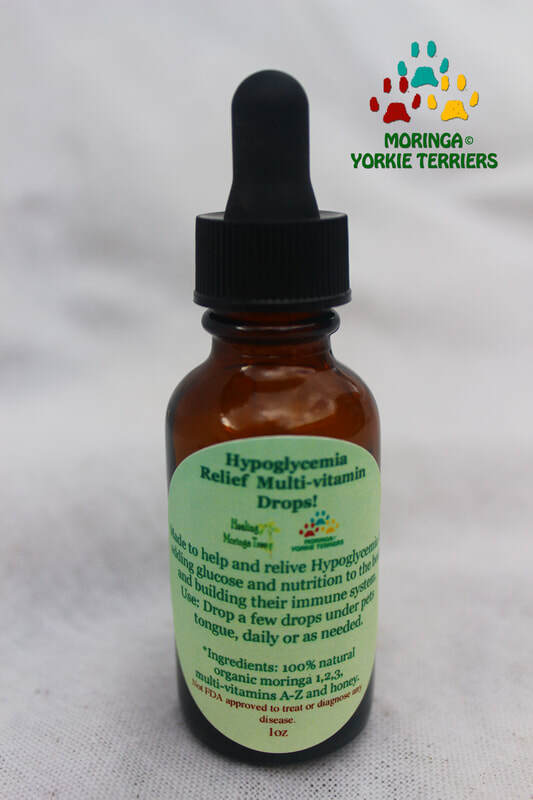 It's recommend that you have our Yorkie hypoglycemia Relief Multivitamin Drops on hand for all emergencies and especially when you travel with your yorkie. 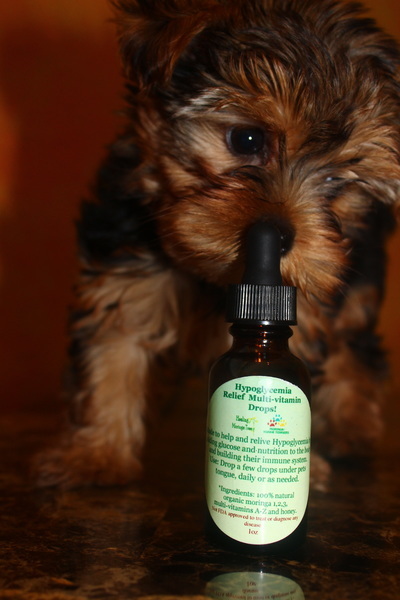 Use: Drop a few drops under pets tongue, or massage drops on gums daily or as needed. *Ingredients: 100% natural organic moringa 1,2,3, multivitamins A-Z and honey. 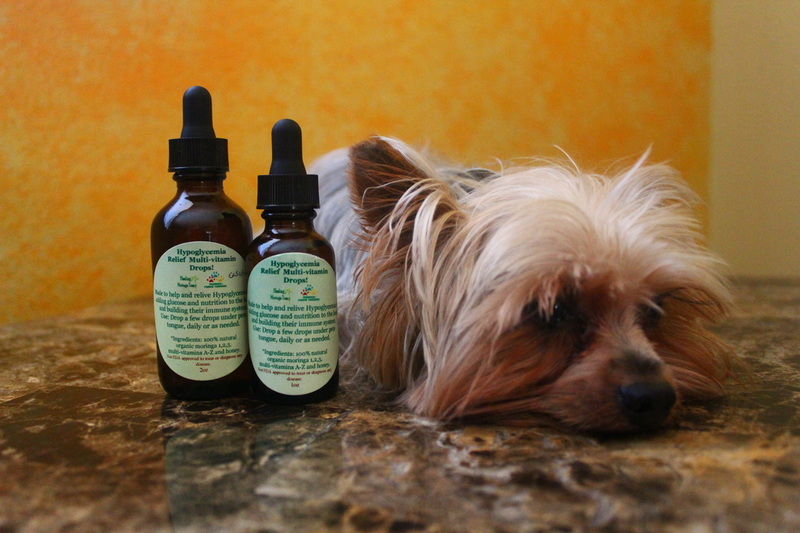 Dog Health Care Treating Low Blood Sugar in Dogs & Puppies! 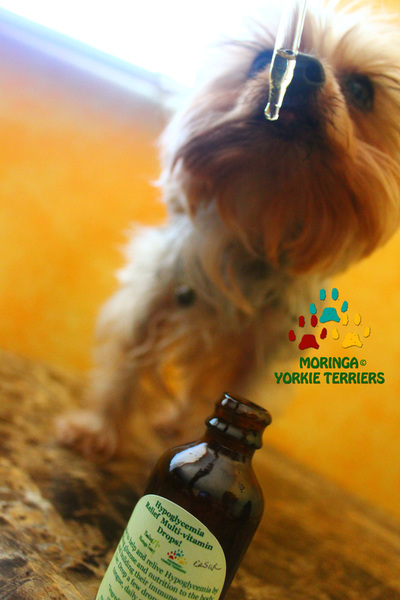 Yorkshire Terrier Hypoglycemia Relief Moringa vitamin Drops..
​We Thank our Heavenly FATHER and His SON for this web site and the LOVE shown.